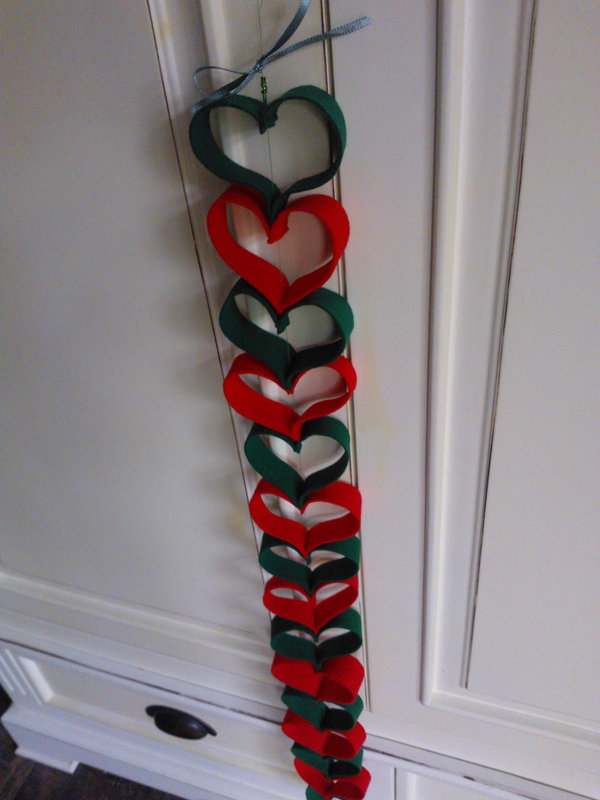 This pretty garland in Christmas colours is a quick and easy decoration I made for this year’s festive season. It is so simple that even the most reluctant sewer could cobble it together in no time! 1. 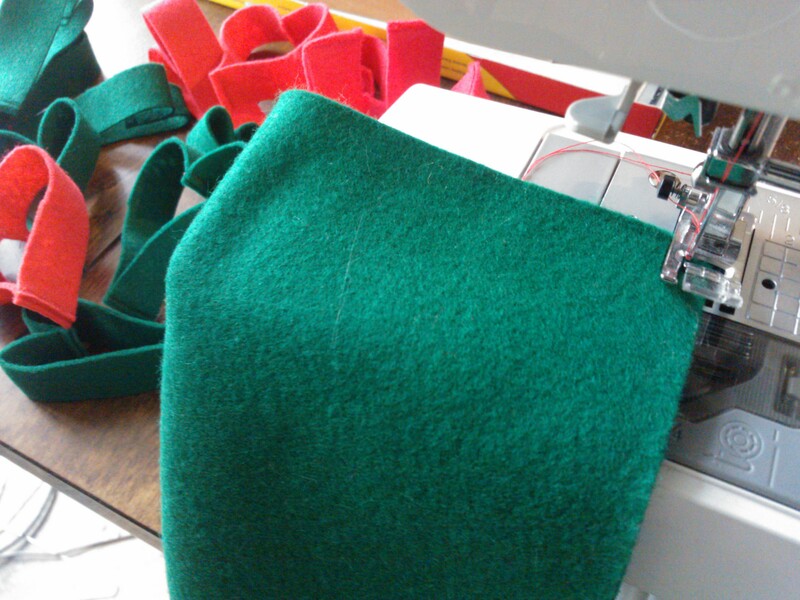 Simply take two felt rectangles in contrasting colours – I used red and green to give it a Christmassy feel – then fold and sew your first piece along the longest edge to join it. (I used my sewing machine for speed, but you just do a quick running stitch by hand). 2. Next, you need to cut a straight line along the other long side (not the side you just sewed) – so you now effectively have two rectangles joined on one side only. 3. Now, open the newly cut edge and fold the felt around through 180 degrees, and sew this edge together. 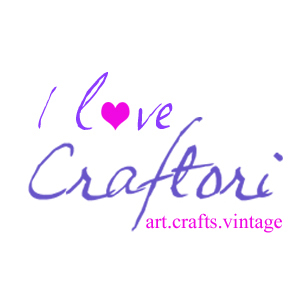 A cut heart – by folding and stitching the fabric back on itself a heart shape is created. 4. 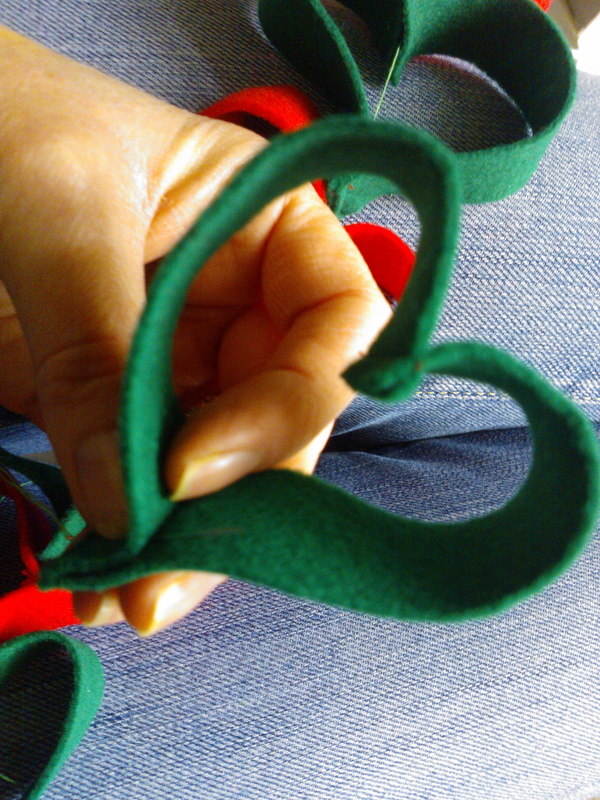 You now have a sort of heart shaped tube – all you need do to create the hearts now is to cut this folded & stitched felt tube at 1.5cm (or 1″) intervals. 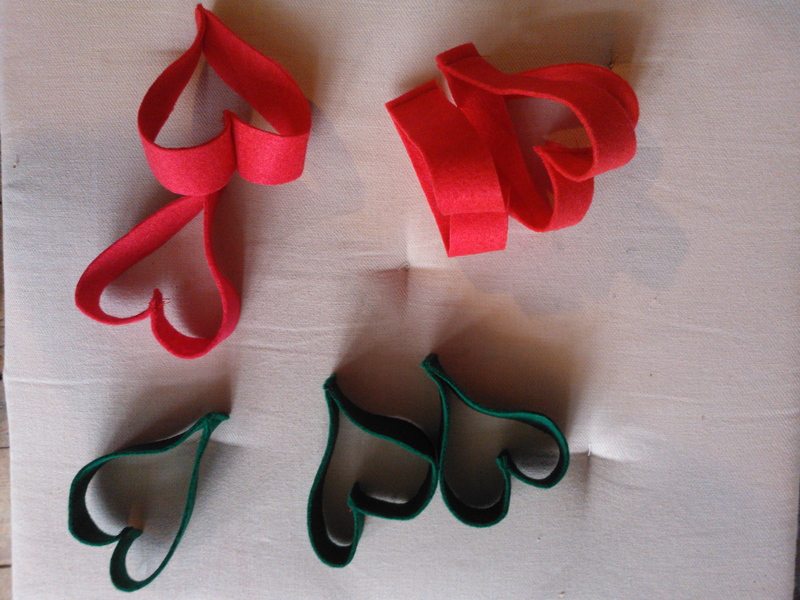 Red and green felt heart pieces, ready to be strung together. 5.Follow the steps above for your other felt piece and you have two colours of hearts which you can attach to eachother to make a garland. I used a needle and thread and simply strung them vertically, but you could fabric-glue them side by side to make a horizontal garland just as easily. To retain their perfect heart shape I recommend fabric-gluing them to stiffen the heart shape as there is movement in my design, but I quite enjoy the imperfection so am leaving mine as is! 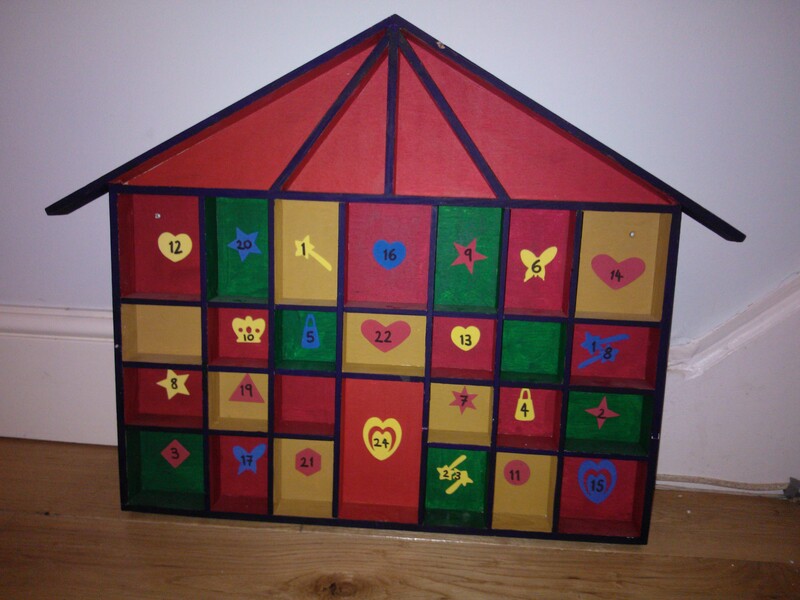 Re-recycled Advent House, ready for some Advent Adventures! Time to wheel out our huge advent calendar again (recycling in action!) It’s lovely creating new Christmas season traditions when you have a family of your own, and this one will continue as long as the kids want to do it! Last year if you remember I tried giving them little Advent Activities to enjoy instead of gifts, sweets & stickers (see https://shabbyshe.wordpress.com/2012/12/01/advent-season-already/) – it was a massive hit with them and my son actually asked if we could do the same again this December! It’s such a nice alternative to those chocolate calendars which have them baying for more sweets at breakfast time! Plus whoever heard of an Advent calendar having 25 doors – it should be 24, right? 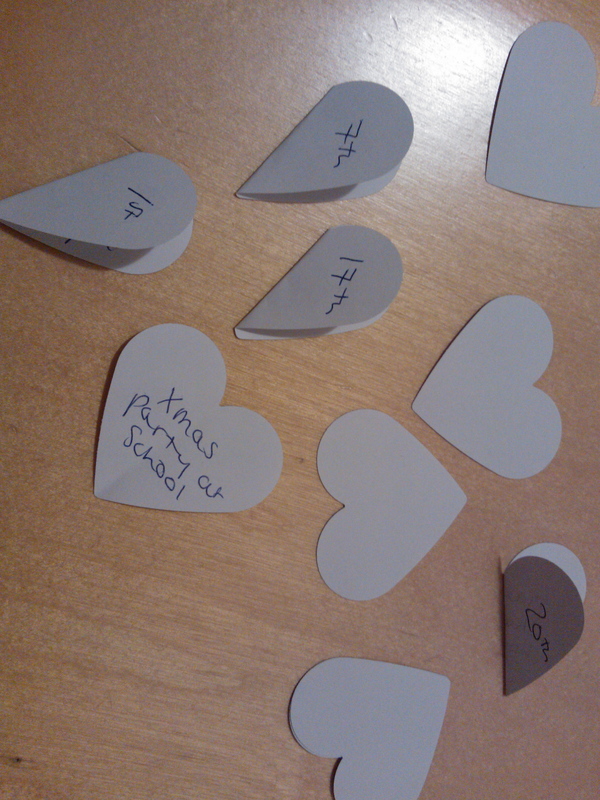 For this Advent season, I’ve used my heart shape cutter to make little hearts and written an activity or event on each one. This requires careful consultation with my diary to make sure I don’t plan something we’re doing something else. Now they are both in school, we can include some school activities such as Christmas parties which makes life easier! I then folded up the hearts and wrote the date, all ready to stick in the little numbered windows. Easy as pie! What are you doing for Advent this year? One of our exciting Advent challenges (otherwise known as keeping the kids busy!) was to create some Christmas crackers. I always find the shop bought ones a let down so this seemed a good opportunity to let the children get creative! We reused kitchen roll tubes cut in half and wrapped them in tissue paper, with stickers and little knick-knacks inside. OK the adults will probably still groan, and they don’t snap, but I think they are so much prettier than the mass produced versions and the children have the added satisfaction of everyone’s admiring looks! Plus noone has to wear an oversized paper hat now…. As you can see from the state of my kitchen table it was not a tidy job but I think the results look stunning. I can’t believe how December has crept up on me this year! Had a slightly panicky moment getting the advent calendar ready on Friday evening, last minute again! I’ve gone for a different theme this year – instead of each evening putting a mini toy, stickers or sweeties into the small compartment for that day (quite a challenge with one for each child) I’ve stuck little folded cards in with various messages. There’s a mixture of challenges (eg. put on a Christmas show for mummy and daddy), visits (already in the diary – eg. 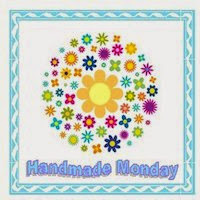 let’s go and watch the Christmas play), crafty things (make a sparkly picture with your holiday stencils) and just 3 or 4 lucky dips (sweets, little pencils etc). 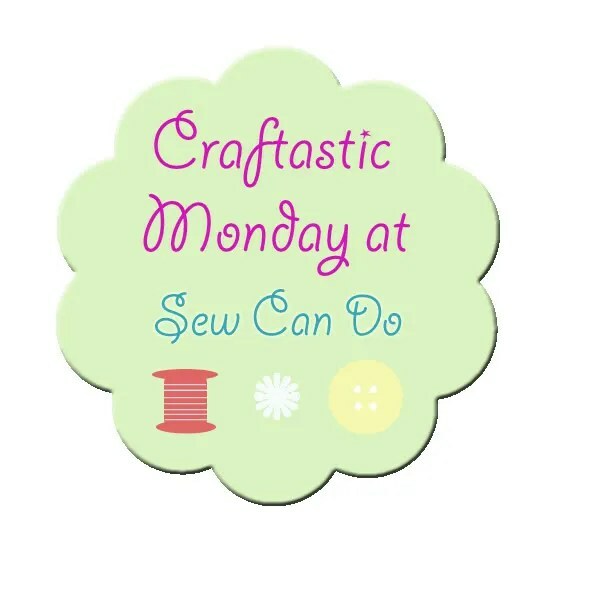 I had a look at Netmums for inspiration – there are always loads of fab ideas on there. The advent calendar itself was given to us by our neighbours – it was one of those wall mounted shelf units for displaying little ornaments, such as thimble collections I imagine. Their kids had played houses with their little character toys with it. As it was plain wood I painted it with acryllics and then numbered some foam sticker shapes and stuck them in. Voila – a repurposed ornament display enjoying a new lease of life as an advent house! I hope the little ones appreciate the effort! They both immediately got in the holiday spirit by dressing up in their Father/Mother Christmas outfits and dancing to some Christmas pop tunes (today’s musical challenge) and as their daddy lit the fire it was a really cosy start to the advent season!